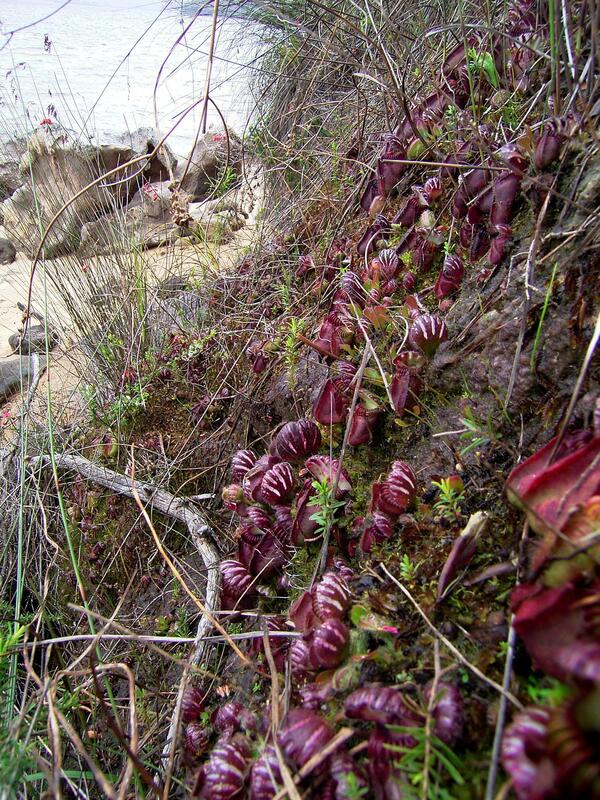 If you were to take a walk along the beach around Esperance Bay between Albany and Esperance, Australia, you might stumble across a very peculiar looking carnivorous plant. 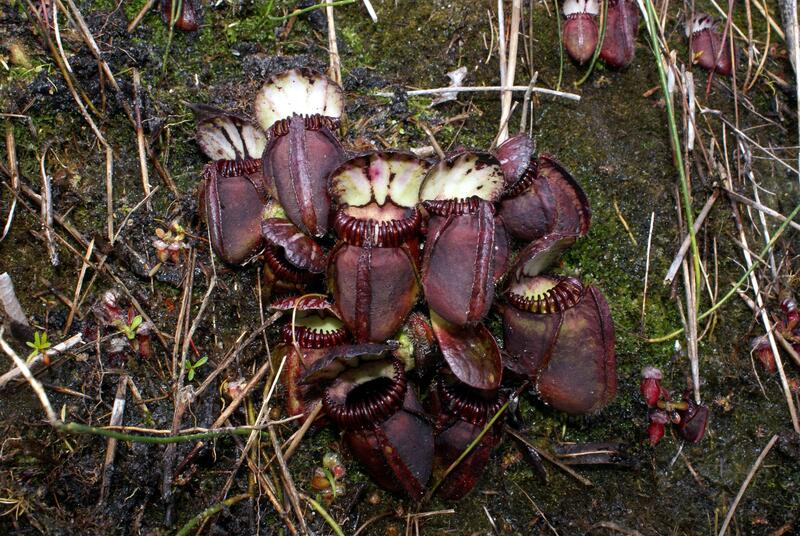 The Cephalotus follicularis, also known as the Australian pitcher plant or the Albany pitcher plant, is a compact, low-growing plant with little hairy pit-fall traps. 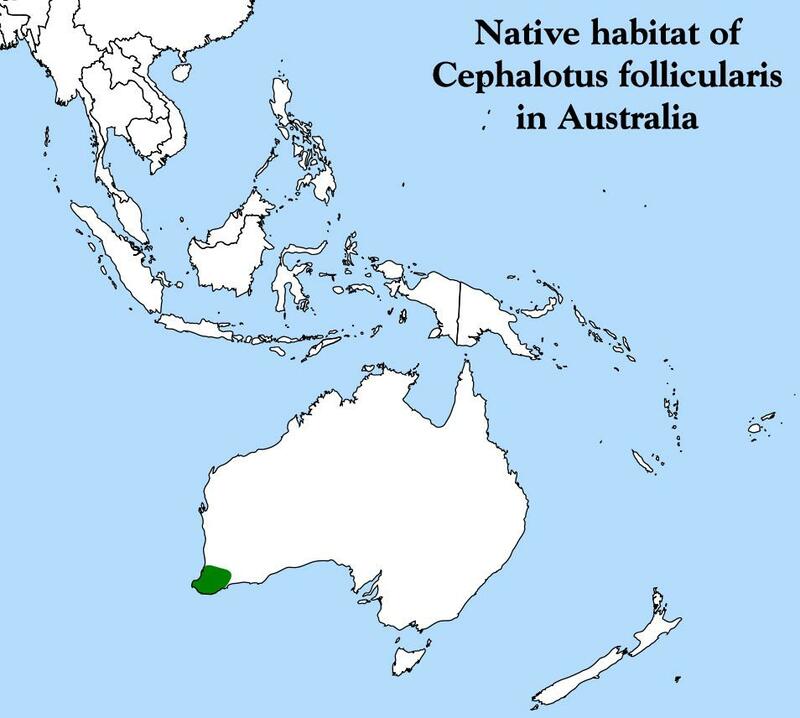 Like the Venus fly trap, the Cephalotus follicularis is a monotypic genus, meaning that it is the only species (follicularis) in its genus (Cephalotus). Further, it is the only species in the monogeneric family Cephalotaceae. The first published account was by Jacques Labillardière in the 1806 publication Novae Hollandiae Plantarum Specimen, a two-volume work describing the flora of Australia. Labillardière gave the plant its Latin name Cephalotus follicularis. 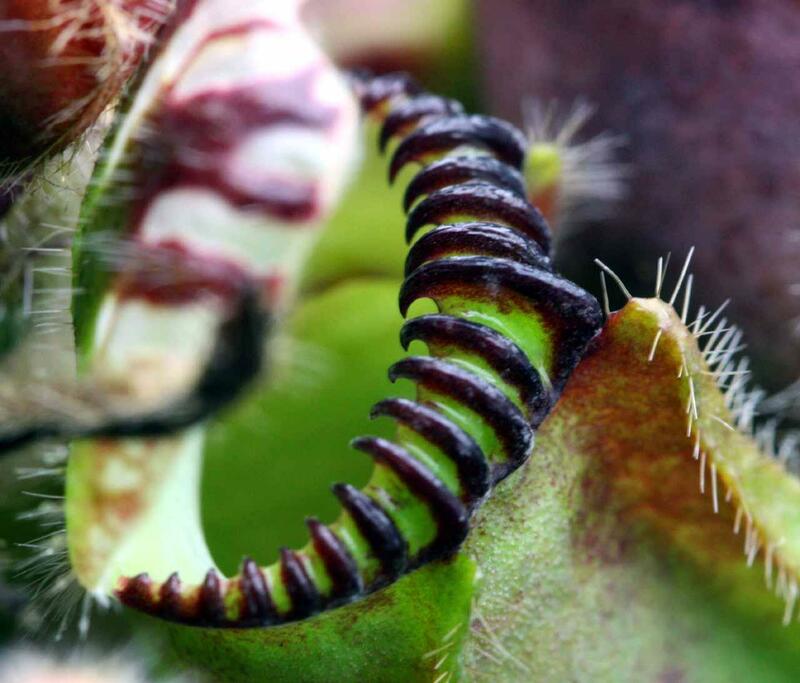 The word Cephalotus comes from the Greek “kephalotos” meaning “headed”, referring to the filaments of the stamens. Folliculus in Latin means “a little sack or bag”, which describes the shape of the carnivorous pitchers. Brown concluded that the Cephalotus follicularis warranted its own family and created Cephalotaceae. It has remained there ever since. 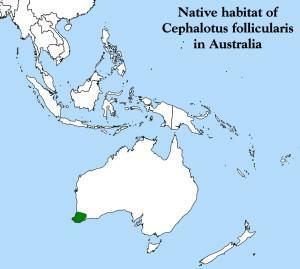 The native range of the Cephalotus is about 250 miles long and 50 miles wide stretching from Augusta to Cape Riche. Like most carnivorous plants, it is commonly found in wet seepages. It prefers soil that is peaty and sandy, with good drainage. The climate in this part of extreme south-western Australia is Mediterranean-like. Summers are warm with an average high of 77°F (25°C) and occasionally hot weather reaching over 100°F (40°C). Winters are cool, mild and wet with temperatures rarely dipping below 40°F (5°C) and only the occasional frost. 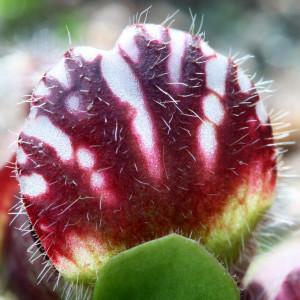 Cephalotus are often found growing in the partial shade of bushes and grasses in damp, open areas. For those of you lucky enough to have seen carnivorous plants in the wild, this should come as no surprise as most carnivorous plants prefer to grow in areas similar to this. Sometimes colonies of Cephalotus are found growing only a few feet away from the ocean on mossy banks with fresh water running through. 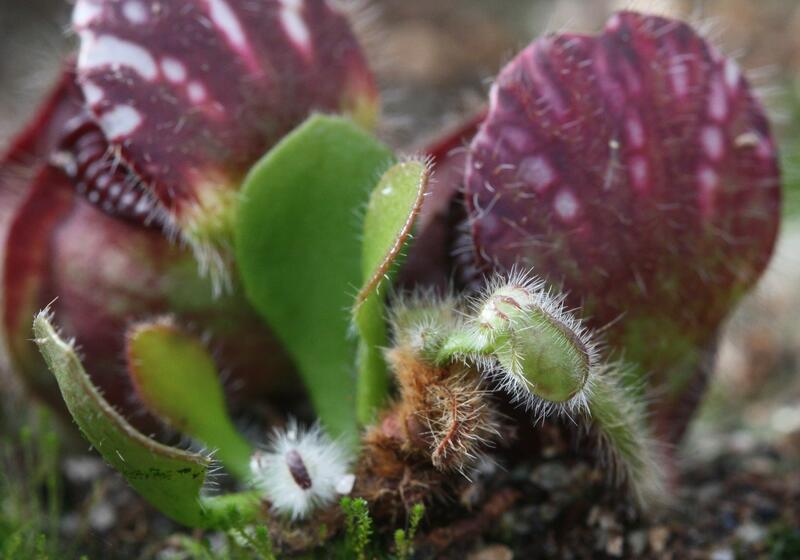 Unlike most carnivorous plants which grow only one type of leaf, Cephalotus have two very different types of leaves: the non-carnivorous leaves and the pitcher leaves. In early spring, non-carnivorous leaves begin to grow as the days lengthen. Several of these flat, spear-shaped, hairy, bright-green leaves will emerge from each rosette growth point. These non-carnivorous leaves will last for about a year and wither just before the new leaves emerge the following spring. 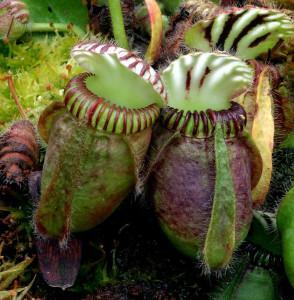 The most likely purpose of the non-carnivorous leaves is to provide a boost in energy from photosynthesis before growing more carnivorous pitchers. 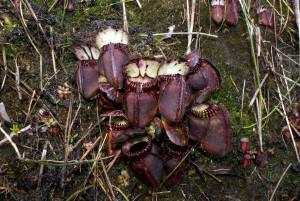 As spring transitions to summer, the carnivorous pitchers begin forming. They start off looking like little hairy knobs at the end of long petioles. Slowly, they inflate to become a pitcher trap. Pitchers can be up to 2 inches (5cm) in size, but are more commonly 1 inch to 1.5 inches (2cm to 4cm), and will rest on the ground with their “mouths” facing away from the center rosette growth point. Occasionally there are leaves that form that are in between carnivorous and non-carnivorous leaves. Many people believe that these pitchers provide a clue as to how the complicated pitchers evolved. 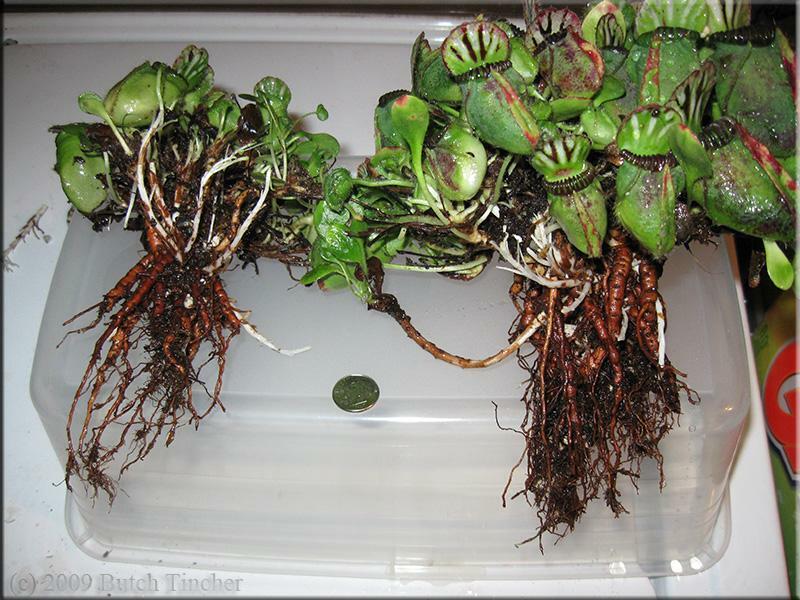 Below the soil, Cephalotus have wiry, brittle roots. Young plants have roots that are thin and fragile, but the root system will eventually develop into thick and branching underground rhizomes that will form plants next to the mother plant. The traps are short and tubby with three hairs on the lid and three ribs on the front of the pitcher. These three ribs lined with hairs almost certainly guide insects to the mouth for their ultimate demise. There is a colorful, white-striped, hairy lid – also called the “window” – that adorns the top of each pitcher. Similar in appearance to Sarracenia minor and Darlingtonia, the color of the lid probably helps to attract insects to the pitcher. The lid overhangs the mouth of the pitcher and helps prevent them from filling up with water, which would make the trap unable to capture prey. The mouth of the pitcher has a well-developed rim with about 24 ribs or teeth. This distinct rim and teeth give it a similar appearance to pitchers of some species of Nepenthes. The spined ribs curve over the lip of the pitcher and end in a sharp point directed down into the pitcher. 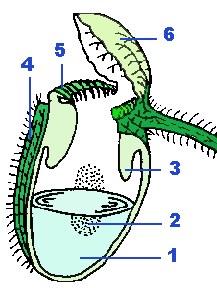 Nectar glands cover the underside of the lid and the surface of the pitcher, excluding the rim. The top of the pitcher tube is has a beneficial feature in that it is somewhat funnel-like with a wide, thick collar just below the rim that overhangs the well of digestive fluids below. This collar is bright white in color and its surface is covered with microscopic projections that point downward. This collar with downward-pointing projections is slick and insects will slide off the surface into the well. The fact that the collar is overhanging makes any escape attempt from within the pitcher nearly impossible. Any insect struggling to escape will eventually tire and drown, being slowly dissolved in the digestive fluids. Inside the pitcher, there are many dome-like glands that secrete the majority of the fluid that fills the pitchers. On the inside of the pitcher wall, there is a kidney-shaped area, magenta-black in color, covered with tiny glands. In green pitchers, this kidney-shaped area can be seen from the outside of the pitcher. The apparent function of these glands is to secrete digestive enzymes. In mid to late summer, mature Cepahalotus will flower. The stalks are quite long for such a diminutive plant, reaching 24 inches (60cm) or more in length. Like Venus fly traps, that also long tall flower stalks, the Cephalotus wants to keep potential pollinators a safe distance from its traps. The flowers are very small, around a quarter-inch across, and have no petals. 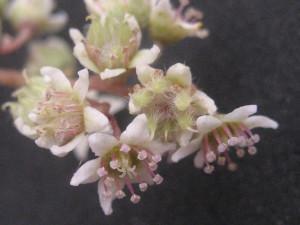 The tepals are pale green or white in color in order to compensate for the lack of petals and attract pollinators. Flowers need to be pollinated, but Cepahalotus is self-fertile and produce one seed per ovary with 6 to 10 seeds per flower. Seeds are small, yellow in color, and quite hairy. Seeds should be sown immediately after harvesting because the viability of the seed is brief. 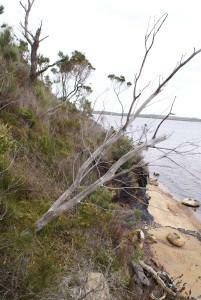 Stratification studies have been done that vary the time of stratification from none to eight weeks. There was no significant difference in germination rate of stratified seed as compared to seed sown fresh. 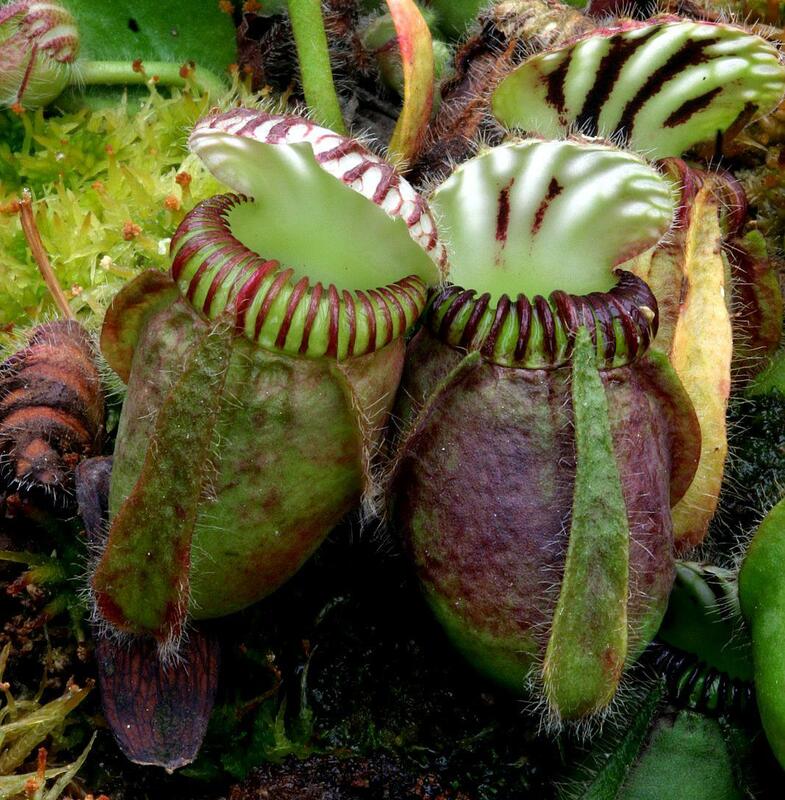 Further, most plants that set seed in the summer, like the Cephalotus follicularis and Dionaea muscipula almost certainly do so to give their offspring a chance to germinate and get established before winter and dormancy arrive. The Cephalotus isn’t the easiest plant to cultivate, but with a little care and consideration, it can do well in a fairly wide range of conditions. Cephalotus can tolerate temperatures ranging from lows of 35°F (2°C) with frosts in winter and highs of 104°F (40°C) in the summer. They will do best, however, with more moderate temperatures between 40°F (5°C) and 90°F (32°C). Being native to coastal areas, they appreciate cooler nights and extended periods of heat without a temperature drop below 70°F (21°C) can weaken the plant. Like most carnivorous plants, Cephalotus is sensitive to minerals in its water. Any water with mineral levels of 50ppm or more isn’t suited for use on Cephalotus, so it’s best to use mineral free water whenever possible. Distilled water, collected rain water or reverse osmosis water all work well. Overwatering is the number one reason why Cephalotus in cultivation perishes. Be sure to keep the soil damp, but never wet. Cephalotus should never be left standing in water if they are in short pots and even if they are in tall pots, it’s better to water them to get the soil moist and then remove them from standing water. It is also recommended to water from the bottom only because top watering can lead to crown rot. Cephalotus does well a wide range of lighting, from bright shade to full sun. The more sun the plant receives, the more red coloration the pitchers will have and the healthier the plant will be. The pitchers also tend to be smaller in size in full sun. In bright shade to partial sun, the pitchers will stay greener and grow larger. Most growers recommend at least 4 hours of direct sunlight for a healthy Cephalotus. Cephalotus grow well under artificial lighting also. When choosing a lighting setup for your Cephalotus, an economical choice is a compact fluorescent bulb. Look for a bulb that’s labeled “cool white” or “cool blue” in color temperature. This means that the bulbs will have a color temperature in the 6500 Kelvin range, which is ideal for growing. 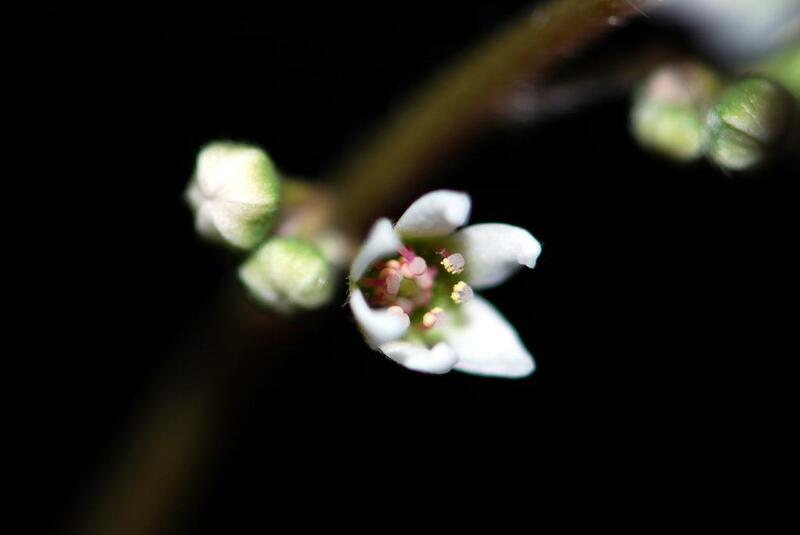 Warmer colors, like those in the 3000 Kelvin range, are better suited for flowering. However, you’ll likely not get your plant to flower unless it is grown outdoors or in a greenhouse where it can experience the changing of the seasons. The lights should be kept on for 14 to 16 hours during the spring, summer and fall months and 12 hours during the winter. I grow my Cephalotus in the same mix that I use for Venus flytraps – 5 parts peat, 3 parts silica sand, 2 parts perlite – and they do well in that too. Whatever you choose to use, make sure that it has good aeration, drains well and nutrient poor and acidic. 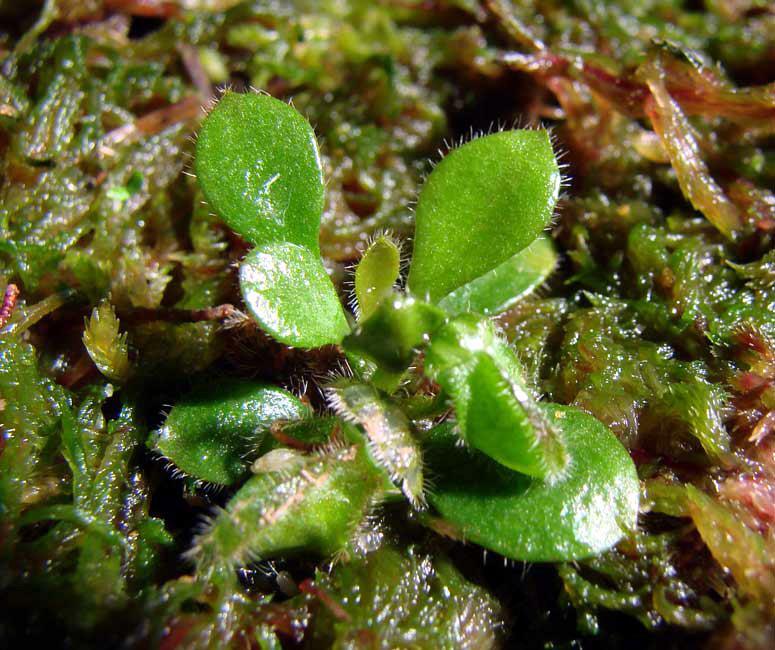 Never use potting soil, or nutrient-enriched peat moss, like Miracle-Gro brand, because it will kill your Cephalotus. The number one killer of many Cephalotus in cultivation is overwatering. People have even coined the phrase “sudden Cephalotus death syndrome” which is most likely a result of root rot from overly wet conditions. Avoiding this is fairly easy, however. Using a large, deep pot and watering from the bottom will keep the soil moist without keeping the roots too wet. A large deep pot will also allow you to grow the plant for a quite a while before having to consider repotting it. With a sufficiently large pot, repotting can be done only every other year. Cephalotus do best in insulated foam pots that provide protection for their roots, but plastic pots work well, as do glazed clay pots. Whatever pot is chosen, it is imperative that the pot has a drain hole. When repotting a Cephalotus, great care should be taken not to damage the roots. Their roots are fleshy and brittle, like celery but not nearly as strong as celery stalks, so Cephalotus roots break easily and one has to be fairly careful unpotting and then repotting them. But repotting doesn’t kill the plant, only sets it back for a while. Repotting in the winter or spring is advisable so that they can have their set back at a time when they are not as actively growing, rather than repotting them in the spring or summer and setting them back when they’re putting out lots of new growth. As with most carnivorous plants, feeding isn’t necessary. The plants get all the energy they need from photosynthesis. However, Cephalotus enjoy the occasional insect and will grow a bit faster if fed. Any insect will work and ideally, they should be recently killed or still alive. Fertilizing is possible if done with care. Some growers occasionally drop slow release nitrogen tablets into pitchers. One can also use a high-quality orchid fertilizer at a diluted strength (1/4 to 1/2 teaspoon per gallon) and put a few drops into the pitchers every 4 weeks or spray the plant to foliar fertilize it. However, be very careful to never use any fertilizer on the roots. Beware of scale on Cephalotus. Scale is rare in a clean greenhouse with some preventive insecticide spray from time to time, but scale really love Cephalotus, and they can get in places that are difficult to see when you inspect the plants. Acephate (Orthene) kills scale very effectively and doesn’t harm Cephalotus. Fungal growth is also fairly common and is usually due to low light conditions and stagnant, humid air. Use a fungicide to help control it. Prorogation is most easily done vegetatively. 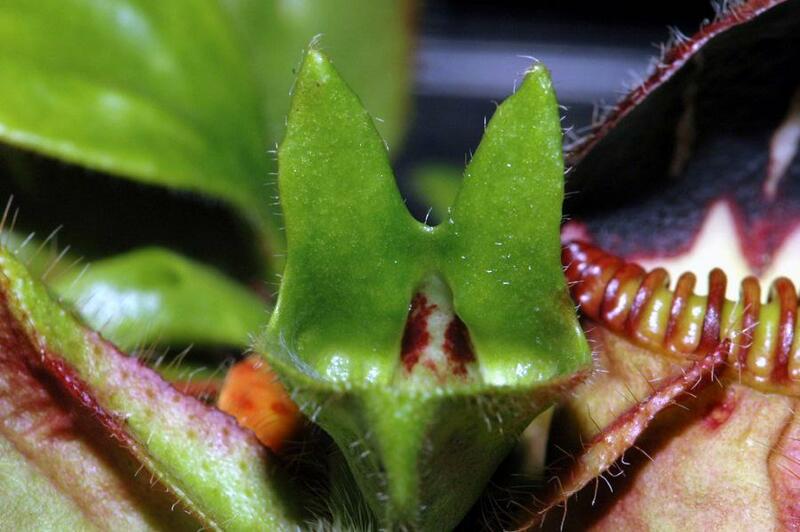 Pullings of pitchers or non-carnivorous leaves can be taken by tugging on the petiole while trying to pull off as much of the white leaf base as possible. If you’ve taking pullings from Venus flytraps, the technique is very similar. The pulling should be partially buried in your chosen soil mix for growing mature plants. Keep the pullings in warm, bright, humid conditions and you should see plantlets appearing after several weeks. When a root system has formed after a few months, the pullings can be transferred to larger pots where they can continue growing. A mature plant can be obtained in 2 to 3 years using this method. This technique should be done when repotting the plant and is quite a bit faster to get adults plants than the leaf pulling method. When you repot your plant in late winter, thoroughly rinse all the soil away from the roots, of course being careful not to damage them. Then simply trim away bits of the rhizome and roots that are at least one inch in length, leaving much of the mother plant untouched. These root cuttings should then be laid on your soil of choice and covered with about 1/2 inch (1cm) of media. Like the leaf pullings, keep the root cuttings in warm, bright, humid conditions (clear plastic bags or containers work well) and, if your propagation attempt is successful, shoots will appear in a few weeks. When your plant has grown to the point that it has several crowns, it is fairly easy to successfully divide them into multiple plants. Like root cuttings, this method should be done when repotting your plant. After the soil has been rinsed away from the roots, look for a place to divide the mass of roots where each crown will retain a significant portion of the roots. Cephalotus is fairly easy to propagate in vitro. Starting with seed is the easiest, but initialization can also be done with leaves, traps or roots. The growing medium of choice seems to be 20% Murashige & Skoog with full vitamins, though there hasn’t been much research done on the optimal medium for Cephalotus. Even in vitro, the plants are quite slow growing and can take a while to propagate. I’ve heard differing reports on the difficulty of deflasking Cephalotus and I’ve yet to deflask any myself, so I’ll reserve comment on this until I do. Well-draining, nutrient-poor soil with good aeration is essential. Deep pots work best because they provide enough room for the roots to grow without having to stand in water. Keep the soil moist at all times but never wet. Be very careful not to over water. Feeding is optional, but the plant will benefit from the occasional insect or being lightly fertilized. Watch for scale and fungus on Cephalotus and treat them appropriately when discovered. Propagate your plant vegetatively through divisions and pullings so you can share them with your friends!